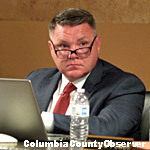 ﻿ LSHA RFP: After Mystifying Explanations, Gov's Confused Board Says – "Columbia Bank – Sue Us"
COLUMBIA COUNTY, FL – It was touch and go for over an hour on Monday night to see which way the Governor's Lake Shore Hospital Board would swing on the Columbia Bank RPF protest. The ultimate question was: would the Authority Board again rubber stamp a recommendation which was not in the RFP? In January 2019, LSHA Attorney Fred Koberlein, Jr. and LSHA Manager Dale Williams put together a Request for Proposals (RFP). The title of the RFP could not have been any clearer: Request for Proposals, (2019-001), Interest Rates – Certificates of Deposit. In most of America, anyone that read that would think that this had to do with the "six (6) CD's totaling $5,167,819.81," which was the title of the RFP. Chairman Beil called the Columbia Bank Bid Protest segment of the meeting to order. Immediately, Attorney Koberlein began whispering. Chairman Beil gave everyone an opportunity to be heard. Chairman Beil asked if anyone would like to speak. Suzanne Norris of Ameris Bank and David Lepri of TD Bank indentified themselves and gave a list of each bank's community involvement and other information. The RFP did not call for this information. At a prior meeting, Manager Williams explained that all of the banks met the requirements for the Authority's local preference policy. It appeared that in order to bolster the recommendations of both Manager Williams' and the Authority's go-to auditor-accountant-outside auditor-financial advisor (all one person) Richard Powell, Manager Williams solicited Americas and TD banks to appear at the meeting and trumpet their bonafides. Columbia Banks attorney, Joel Foreman, jumped right on that telling the Authority, "This isn't about a contest to see who is the best community bank and who does the most for the community and the children and things like that. The RFP did not match what you ultimately awarded. Columbia Bank Attorney Joel Foreman addresses the Authority. Mr. Foreman continued, "Nowhere does the Authority indicate... that you're thinking about moving all $14 plus million of your deposit business... You had an RFP with a hard number on it, but by the time the process was completed and you were considering the vote, you were considering what to do with over $14 million... We are asking you to throw out this process and start over." Attorney Koberlein said that there was not a lack of specificity in the RFP. On February 11, 2019, the Board awarded $9 mil of banking services of which there was not one word in the RFP. Attorney Koberlein said, "The cleanest method is to either rescind the award and rebid the process in its entirety, or to move forward with the awards that were announced." Did Columbia Bank Bid on the Other $9 Million? Columbia Bank President David Bridgeman. Chairman Beil asked, "Did Columbia Bank bid on the other $9 mil?" Attorney Foreman said, "Unless Mr. Bridgeman wants to correct me, we –unintelligible-. Mr. Bridgeman followed up, "We did not expect it to be part of the RFP process." Manager Williams mentioned a workshop that had nothing to do with and was not mentioned in the RFP. A check of the minutes of that LSHA workshop reveal that the LSHA's minutes have become even more de minimis than they were under former manager Jack Berry. The workshop minutes are silent regarding CDs and investment policy. Manager Dale Williams explains his version of events as board member Janet Creel looks on. Manager Williams said, "There was an attached page of specifications. It did say 'The amount of funds to be placed in Certificates of Deposits by the Lake Shore Hospital Authority may be more or less than the amount currently on deposit.'" 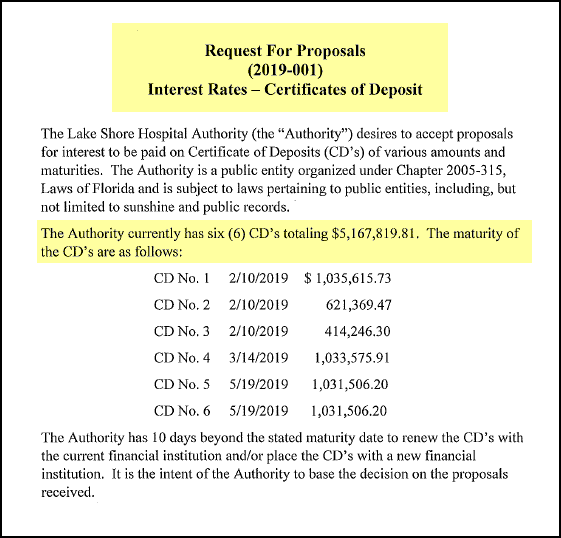 Manager Williams continued, "It also says 'The number of Certificates of Deposits and the amount per Certificate of Deposit is to be solely determined by the Trustees of the Lake Shore Hospital Authority." Manager Williams did not say that nowhere in the RFP did it mention the other $9.1 million dollars on deposit in Columbia Bank. Board member Mark Thompson asked, "The RFP for the 5.1 [million dollars] and then there was nine other. What vehicle was that 9 other in?" Manager Williams answered, "We didn't look at it that way. We looked at the total and then we looked at our liquidity plan...."
The Hospital Authority has no liquidity plan. Chairman Beil asked Manager Williams, "So our plan was to put 13 million in CDs? After some more discussion Attorney Foreman told the Board, "When you say, 'I want proposals for $5.1 mil and you award $14.1 million the bank views that as spatially defective... Let people who are submitting proposals know what they are submitting proposals for... When you say 5.1 million dollars down to the penny, that's how much we have, I think it's only fair for people responding to that and say, 'That's most logically what they're gonna' award.'" 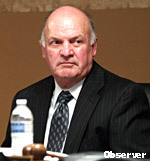 Mr. Foreman concluded, "That is the basis of our protest." After that the meeting got very messy. Attorney Fred Koberlein, Jr.: Where is he finding that law? Attorney Fred Koberlein, Jr. gave some interesting legal advice. Between the votes and trial votes and confusion Board member Lory Chancy said she was still confused. She was not alone, as the whole Board appeared dazed. Ms. Chancy said she couldn't vote because she didn't understand what was going on. Attorney Koberlein told her she had to vote and could not abstain without a conflict. As usual, like he does across the street at the City, he quoted no law. As it turns out, the Attorney General has opined on this and said a few times throughout the years that special districts like the LSHA are not bound by the same law that the City and the County are. Ms. Chancy was well within her right to abstain. It is not clear if Board member Creel was giving credence to Mr. Koberlein's inaccurate advice, but it was clear that she also was in the land of confusion and said as much. Board member Jay Swisher wanted to throw out all the bids and start all over again. He found no allies. LSHA outside auditor-account-financial advisor Richard Powell. He partnered with Manager Williams to come up with a recommendation for which no one asked. 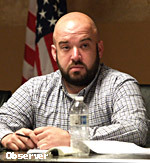 Mr. Koberlein explained that anyone that made a motion at the meeting when the RFP was approved could not make the same motion. This was more bad advice. The LSHA, for decades, has flown by the seat of its pants and never adopted formal rules of procedure. Without those rules, any board member could have made any motion he or she wanted. In the end, the Board voted to deny the protest. The swing vote was by Board member Chancy, who before she voted said the following, "I don't have a choice but to vote and I'm very much against the fact that I'm called on to vote... I'll say yes." Ms. Chancy's vote was based on bad legal advice from Attorney Koberlein. Had Ms. Chancy abstained, like she had done previously, the vote would have been tied and the tie breaker would have been Chairman Beil. We will never know what he would have done. Columbia County: the legend continues.